With CNY goodies looking this good, we think we can deal with some healthy weight gain this year. Image courtesy of The Centrepoint. If you’ve made up your mind to go easy on the snacks this year, these super tasty and interesting CNY goodies will have you thinking twice. Think manually barbecued gourmet Bak Kwa, pastries shaped as cute piglets, exotic local flavours such as Pandan Gula Melaka Marble Cake and plenty more. If you aren’t drooling yet, just scroll down and feast your eyes on the yummiest CNY goodies that’ll have you hogging the snack jars for a long time. Don’t say we didn’t warn you! We’ll definitely be back for more! Oh, bak kwa… What would CNY be without our favourite savoury treat? 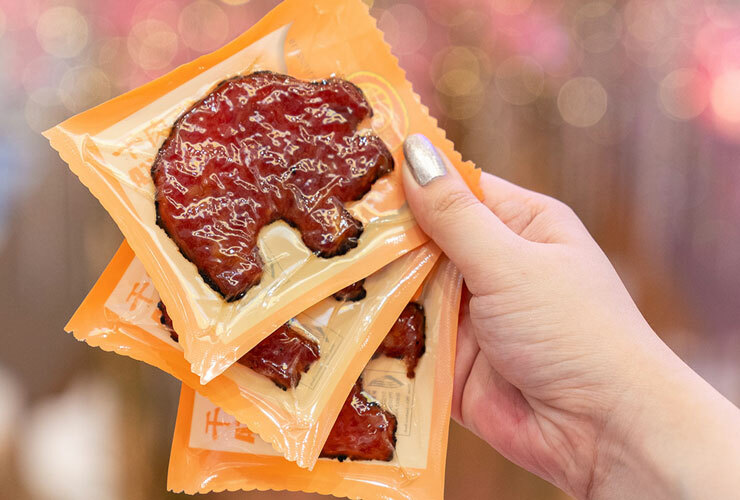 While Bee Cheng Hiang has long been established as a household brand for Bak Kwa, they’ve kept things fresh by re-inventing this traditional snack. Their Gourmet Fusion Bak Kwa is a unique blend of premium pork hind and pork belly, making each slice succulent and chewy. Each bite also promises a smoky flavour and crispy texture in all the right places. 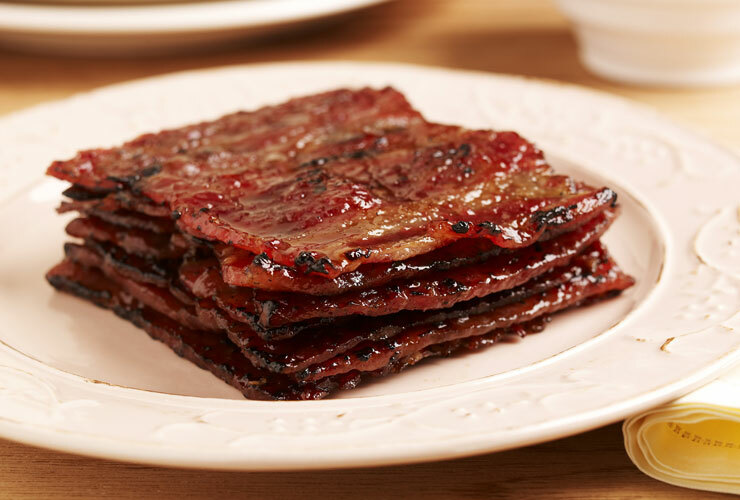 What we love best is that the Bak Kwa is hand-barbecued, and is free from MSG and preservatives. We’ll take that as our cue to indulge more minus the guilt! Gourmet Fusion Bak Kwa, $68/kg, available at Bee Cheng Hiang. Bee Cheng Hiang is located at Causeway Point, Waterway Point and Northpoint City. Check out new flavours this CNY. Anything with coconut milk sounds like a real treat to us. So, when there’s coconut milk, coconut flakes, plus crispy pork floss, we know that’s the ultimate dream team. 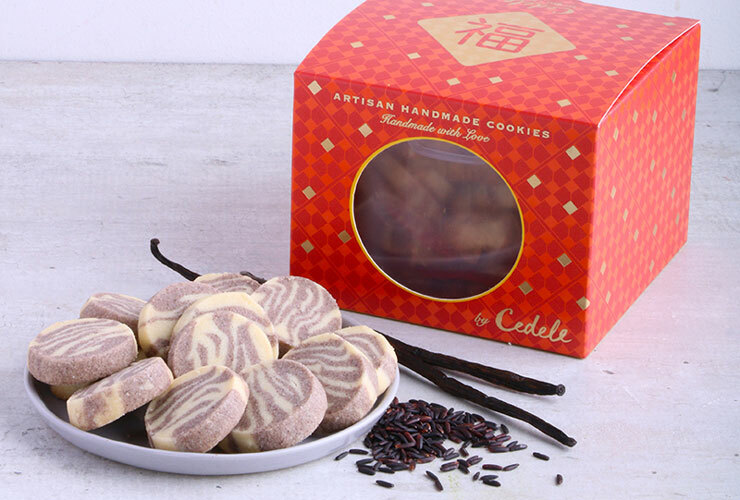 Each cookie is a combination of the natural sweetness of coconut and the savoury umami of pork floss. Plus, they’re also exclusive to Singapore’s Bee Cheng Hiang outlets, so make sure you have a stash of these at home when you’ve got relatives from overseas visiting this Chinese New Year! 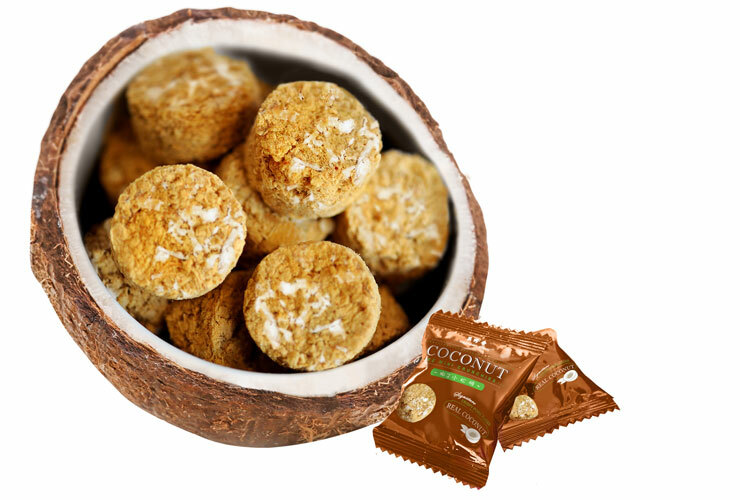 Coconut EZ Mini Crunchies, $15 per pack (115g), available at Bee Cheng Hiang. Traditional treats with a modern twist. Besides looking gorgeous at the dining table, Canton Paradise’s mix of sweet and savoury treats are flavourful and will be a sure-hit among the young and old. 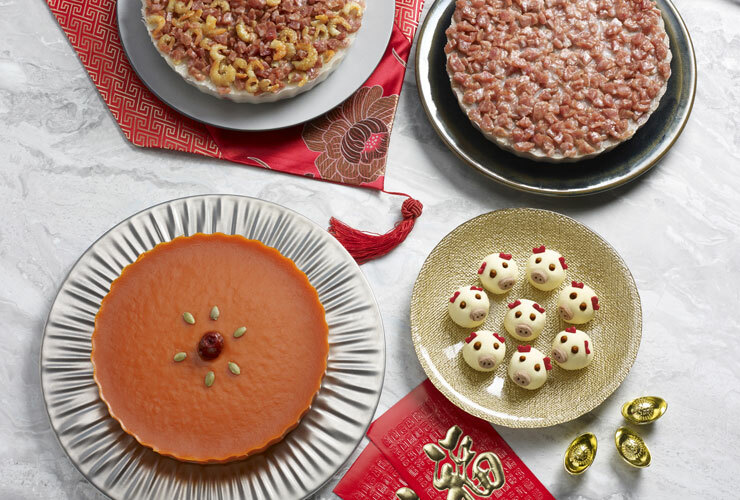 Have your guests cooing at the delectable Piggy pineapple pastries and savouring the Steamed carrot cake with Chinese sausage or Steamed nian gao with coconut milk at the end of a meal. Canton Paradise is located at Northpoint City. Indulge in your favourite local flavours! Cedele sure has got our favourite indulgence right. 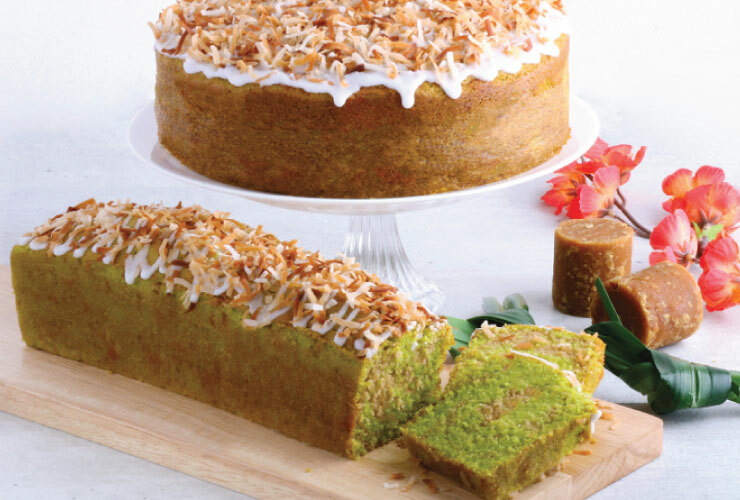 Their moist and tender Gula Melaka (palm sugar) Cake has the sweet, aromatic flavour from Gula Melaka caramel topped off with toasty coconut flakes. Warning: This cake should only be brought out after dinner so no one will be tempted halfway through your reunion dinner. Pandan Gula Melaka Marble Cake, $32, available at Cedele. Cedele is located at Waterway Point and Changi City Point. Grab some of these guilt-free treats for your upcoming gatherings. If we told you that biscuits are healthy, would you believe us? This eggless shortbread is baking powder free and contains Jasberry rice flour that boasts 2.8 times the antioxidants of blueberries. But although it’s a wholesome treat, it doesn’t lack in flavour. The flour gives the shortbread an added crunch and has a berry-like fragrance without being overly sweet. Just what we need to end a hearty dinner! Jasberry Rice Vanilla Shortbread, $21.50, available at Cedele. Get the parties started with jars of these sweet delights! These biscuits will have you hooked after your first bite. With the natural sweetness of candied fruit and honey coupled with the tasty crunch of baked almonds, every piece feels delightful on the palate. Be sure to have more than one jar of these at home, because they’ll be snapped up real quick! 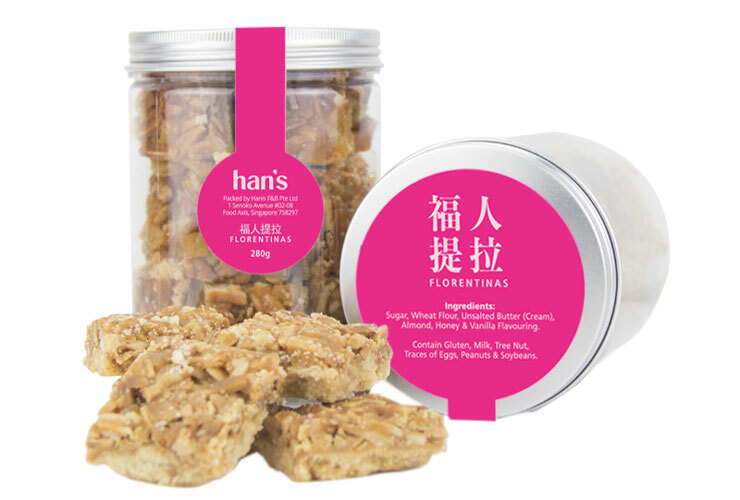 Florentinas, $13.80 (280g), available at Han’s. Han’s is located at Waterway Point, The Centrepoint and Changi City Point. How apt for the Year of the Pig! Tender, juicy and packed with a ton of flavour, the Kurobuta Bak Kwa from Fragrance is simply an indulgence you must allow yourself at least once a year. Kurobuta pork comes from the specially bred Berkshire Pig which has a higher fat percentage, so the meat is extra flavourful. If this isn’t enough to tempt you, just look at how adorable each slice is cut! We also like how they’re individually wrapped to ensure ultimate freshness for each piece. Plus, this helps us to pace ourselves and not devour them all at once! Kurobuta Bak Kwa, available at Fragrance. Please enquire for price in-store. Fragrance is located at Changi City Point, Northpoint City North Wing & South Wing, YewTee Point and The Centrepoint. By now, we should all be fans of the quintessential cheese tart. Who can resist warm, molten cheese oozing out from buttery pastry with each bite? Hokkaido Baked Cheese Tart has one-upped the indulgence with two of our nation’s favourite flavours: durian and salted egg. So, if you’re a fan of either, or better still, both – then you better start getting in line! 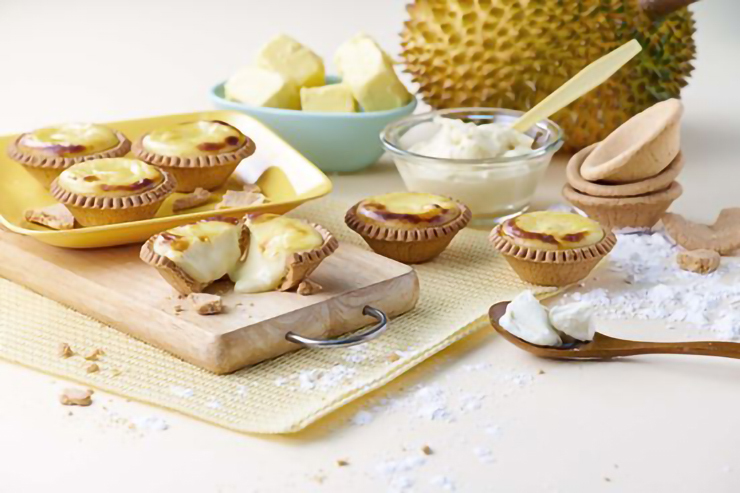 The Durian Cheese Tart has the authentic flavour of the King of Fruits without its overpowering aroma. Take a bite and you’ll realise how the creamy fruit is a match made in heaven with silky cheese. The Salted Egg Cheese Tart packs a savoury kick as an equally delicious alternative to the classic cheese tart. Durian Cheese Tart and Salted Egg Cheese Tart, $2.90 - $3.30, both available at Hokkaido Baked Cheese Tart. Hokkaido Baked Cheese Tart is located at Changi City Point, Northpoint City and Causeway Point. We don’t know about you, but all this talk about goodies makes us want to rush down to the stores and get our hands on these yummy treats. Here’s wishing you a happy and well-fed Lunar New Year!